The apple-plum glaze makes use of a glut of crabapples in the back yard; alternatively, you could use any bottled apple jelly. 1Preheat the oven to 450F. 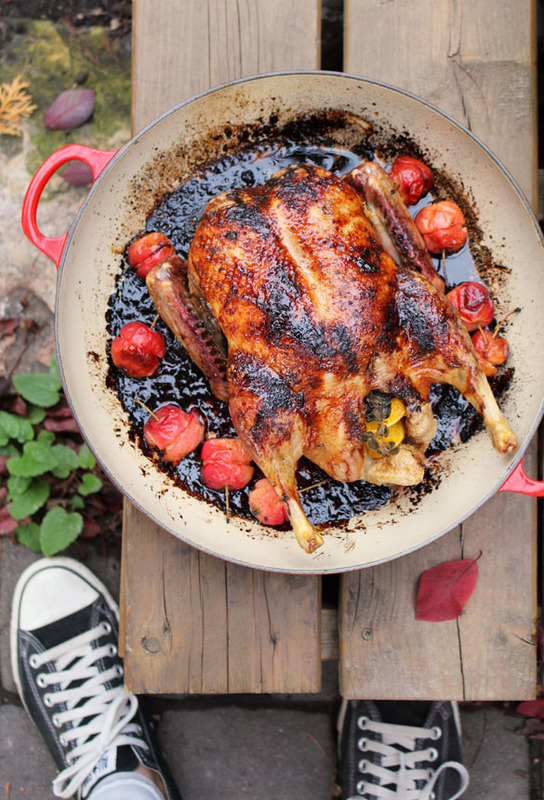 Pat the duck dry with paper towel and place it in a roasting pan. Poke through the skin-without going into the meat-with a bamboo skewer or the tip of a knife in several places. Drizzle with oil and sprinkle with salt and pepper. If you like, tuck the orange and herbs into the cavity – otherwise wait for halfway through the roasting time, after you’ve poured off some of the fat for later use. This way it will go unflavoured. 3Roast the duck for 30 minutes, then remove the duck from the oven and pour most of the fat from the pan into a jar (store in the fridge for up to a month). Brush the duck with the glaze, stuff it with the orange and herbs (if you haven’t already), slice the whole crabapples around their middles and add them to the pan if you like, then reduce the heat to 350F and return to the oven to roast for 1 1/2-2 hours, until the legs wiggle in their sockets and a meat thermometer reads at least 175F. 4Let rest 15 minutes before carving.